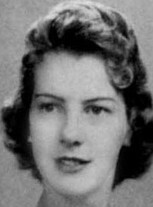 Joyce was a Mary Kay cosmetics consultant for many years. She made many trips to Africa for missionary work. Joyce was a dear friend and the sweetest person you would ever meet. I also remember Joyce Wampler as a very sweet girl. Not only were we classmates at school, we were also car hops at Brownie's Root Beer stand at the corner of Sheridan and Admiral during the summer when we were only around 14-15 years old. Joyce and I were friends from the third grade until she went to heaven. We did almost everything together. She attended my dad’s church with her family. She was in my wedding and I was in hers. She took care of my daughter while I worked. She was a warm, caring person. She had a love for people. She raised her two sons to love the Lord. She was a wonderful mother. I will miss her but know I will see her again.